The season to be wasteful is almost upon us and as light switch ons and festive planning are well underway for many there is still time to plan a zero waste or a more environmentally conscious Christmas at least. Year on year the amount of waste generated at Christmas is phenomenal which costs not only the environment but also local councils in terms of waste and landfill charges. Trees, wrapping paper, decorations, food and even unwanted gifts all play a part in a general overindulgence at this time of year. We’ve compiled a list full of ways to avoid Xmas clutter without losing out on any festive magic. 1) Gift experiences rather than physical gifts – by the time New Year comes around many people are left wondering where they can store their new gifts. By giving vouchers or taking part in experiences it can mean much less waste plus people get to spend more time with each other. 2) Stop sending Christmas cards – rather than sending Christmas cards to everyone perhaps only send to a select few people. Make a donation to charity with the money saved instead or put it towards something more worthwhile. 3) Pre-Christmas de-clutter – taking the time to get rid of old clothes, toys or other items before Christmas could help it be less overwhelming afterwards. Selling un-used items could even help cover the extra cost of Christmas. If you need help decluttering it could be wise to use a local waste services company rather than taking up space in regular household bins. 4) Be creative with your Christmas tree choices – Opting for a reusable tree could mean having it for 10 years before it benefits the environment. Regarding a real tree having one in a pot could be the least wasteful option but then there are lots of ways to be creative using wood, paper and even glassware. Using vintage or handmade decorations could also reduce waste. At the Conservative Party conference this month the Environment secretary Michael Gove has indicated that long overdue investment in the waste management sector may be on the way. In particular he mentioned food waste and the challenges this brings with the suggestion that funding could be made available for better redistribution and more investment in cleaner technologies. Mr Gove talked about current difficulties faced by the sector and described them as “a new front in the war against waste”. The talk comes ahead of Defra’s waste and resource strategy which is expected towards the end of the year. 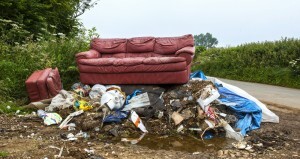 Tougher measures for fly tipping offences as well as companies that flout regulations for waste removal are also anticipated. The background to the changes comes as no surprise to most in the wake of alarming quantities of plastic being dumped in the sea as well as rises in fly tipping rates. Food waste is another big culprit contributing to environmental and social concerns. Investment and funding that is made available could ensure greater distribution of food waste by retailers and the food industry. When it comes to waste we may not often think about the impact unwanted clothing has on the growing landfill problem. The fact is however that around 300,000 tonnes of clothing waste is binned on average each year in the UK. By shopping differently and getting more out of the clothes we buy then this could be reduced. In addition, by thinking about how we get rid of clothes we’ve outgrown or fallen out of love with is another way we can prevent clothing ending up as waste. Today if clothing has a hole in it or a zip goes, it is tempting to just throw an item away. However, it could be mended, especially if it is something fairly minor. If an item is beyond repair it may be something that could be repurposed – cotton fabric to make patchwork or sections of adult clothing used to make something smaller for children perhaps. Even some baby clothing could be used as dolls clothing and socks could be turned into puppets! Washing at lower temperatures and no tumble drying could also help clothes last longer. Many people might already fill a charity bag and leave it outside to be collected. It is possible to donate in bulk also and some charities may pick up clothing from your home. If you are clearing a property after a loved one has died or if you are having a major clearout then it might be possible to ask the waste company you use to make a donation on your behalf. Depending on the size and type of clothing then you could go to a swapping event. Here people meet up with clean and good quality used clothing and swap. Alternatively, if you prefer to get cash for your clothing you could take it somewhere to be weighed and get cash in return or sell it yourself privately or at a car boot or indoor sale. In order to avoid having a build up of unwanted clothes then buying more carefully may be a better solution. Buying clothes that may last way beyond the latest fashion trend could be a far better investment for yourself and the environment. Why it is important to only used Licensed Waste Carriers for Rubbish Removal ? Comments Off on Why it is important to only used Licensed Waste Carriers for Rubbish Removal ? For many people the question of waste removal is down to their respective council and not really the concern of individual householders or businesses. By paying council tax most people believe that the buck stops there. Actually though the rules around rubbish removal are strict and with good reason given the influx of fly tipping in recent years. It is actually the responsibility of the home owner, private tenant or business to ensure that their waste is disposed of safely and legally. Hiring someone to remove any rubbish from your property or business doesn’t mean you have done your job. When you pass on your rubbish to another party it does not mean that rubbish is then their responsibility. Unfortunately there are several so called waste removal companies out there that will take your money and say they will dump the waste for you and do that anywhere they get the opportunity. Ultimately this could mean you being prosecuted as the law states that you are required to get rid of waste legally and responsibly. The law governing what is required is The Environmental Protection Act 1990, Section 34, The Landfill Regulations. These define what is necessary in terms of rubbish removal and the due care afforded to private individuals when getting rid of waste. 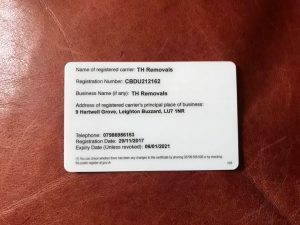 Using a registered waste removal company like TH Removals is the only lawful way of ensuring that you get your rubbish removed. A registered firm will issue you with a Waste Transfer Note (WTN) when they arrive to collect your waste. This is a document that is signed by both parties and means that ownership of the rubbish transfers to them. The waste removal company is then obliged to dispose of the rubbish and you cannot be prosecuted for any wrong doing from then on. Should the waste then be dumped illegally the waste carrier runs the risk of losing their license but most importantly you are no longer accountable. If you don’t hire a registered waste removal firm or you dump the rubbish by the roadside or other illegal site then you are at huge risk of getting a big fine. Councils can issue you with an immediate on the spot fine of £300. If your case ends up in Magistrate’s Court the fine could be up to £5000 and if it goes to Crown Court then the fines could be issued of an unlimited amount. 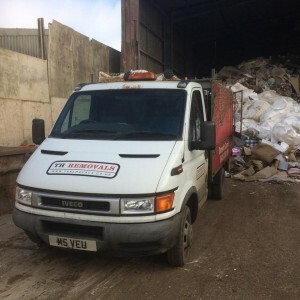 Using a reputable and reliable firm like TH Removals would mean avoiding any legal issues surrounding waste removal. Contact us anytime for a no obligation quote for our services. It doesn’t seem that long ago since we were discussing the freezing weather and how snow might disrupt bin collections. However, we’ve now been experiencing some lovely summer weather for a few weeks which has in turn caused some consequences for rubbish removal – cue rainfall within 24 hours! In all seriousness some councils across the UK have experienced delays to services and in some cases missed collections due to the hot weather. Where possible they have notified residents through their websites and social media and informed them to expect late or delayed collections. In the hot weather some vehicles may be subject to greater chance of breakdown and workers need additional time in order to pace collections whilst maintaining health and safety. Of course it is still possible to engage local private waste removal services should you need extra or additional rubbish collections if you have been missed off your regular rounds. There are things you can do to reduce waste in warmer weather. Using reusable drinks containers could reduce plastic waste and just trying to plan food supply so you eat more fresh meat and produce could reduce the amount of food waste. At this time of year bins for household waste can be prone to smells and even unpleasant infestations so reducing the kind of waste you throw out can reduce the chances of this occurring. Ensuring you rinse recyclable waste thoroughly should help to keep special bins for other materials cleaner. If you are going on holiday try and ask a friend, family member or neighbour to keep on top of your bins by still putting them out on your behalf. This reduces the chance of rubbish being left longer than necessary and even if there are delays it means that you aren’t coming back to any nasty surprises. For anyone seeking advice or assistance with rubbish removal in Hertfordshire, Bedfordshire or Buckinghamshire then we would be happy to help. We can also help with one off collections, commercial waste and house removals. Contact us for more details about any of our services.